Tow trucks provide essential services, including transporting cars after they have been in an accident and assisting police in preventing cars from blocking traffic. However, for all their uses, these vehicles can be particularly dangerous when they are involved in an accident. While all auto accidents pose danger, the risks are heightened when a tow truck is involved. If you have suffered an injury in an car accident involving a tow truck, Salt Lake City, UT car accident attorney Lynn Harris will fight for the compensation you deserve while you focus on recovering. Hook and Chain Tow Trucks: In a hook and chain tow truck, a chain hooks around the frame or axle of the towed vehicle, which is then pulled by hydraulic pulley. Flatbed Tow Trucks: In this setup, a hydraulically-powered truck bed is used to position the towed vehicle on the back of the truck. Wheel Lift Tow Trucks: Wheel lift tow trucks place a metal device under the front or rear wheels in order to prevent the bumper from dragging on the ground while in motion. Boom Tow Trucks: In this configuration, the truck has a slanted boom that is used to hoist the end of the towed vehicle. Boom tow trucks are particularly useful in pulling vehicles out of ditches, mud, and water. Integrated Tow Trucks: Combining elements of the wheel lift and boom tow trucks, integrated tow trucks are generally used for repossessions. Shifting Vehicle: When a tow truck driver fails to properly load a vehicle for transport, the towed vehicle can shift while in motion, presenting a hazard for all other drivers on the road. Disconnecting Vehicle: Any time a car is attached to a tow truck, the driver must ensure it is strapped firmly and safely. If, however, tow cables break loose, the car can disconnect and fall off the bed of the truck. Vehicles directly behind the tow truck will have little time to respond to the detached vehicle. 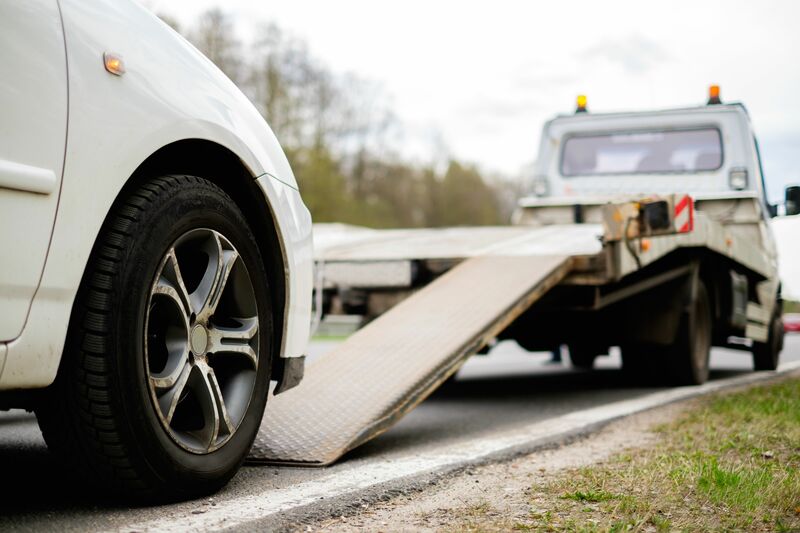 Driver Negligence: Tow truck drivers may cause accidents on account of negligent behavior including failure to pay attention to the road, making an illegal maneuver, and speeding. Improper Maintenance: It is essential that tow truck drivers and the companies they work for inspect their trucks routinely to ensure they are safe to drive. Failure to maintain brakes, for example, can lead to a serious accident if the truck cannot come to a quick stop. Tow truck accident cases can be complex and, in some cases, more than one party will be responsible for your injury. Find out if you are eligible to receive compensation for your medical bills, lost wages, pain and suffering, and more. Contact our law office at (801) 521-3200 or (801) 375-9801 now.